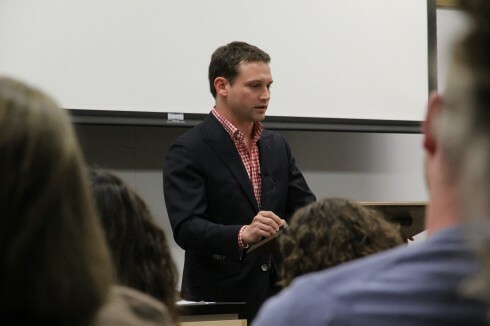 The Department of Language and Literature at ACU believes in the importance of reading, reasoning, and writing effectively in order to serve God in an information-driven world. 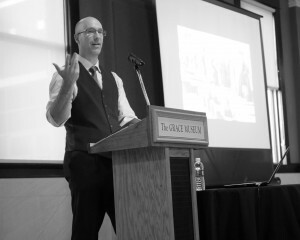 On Thursday, April 14, our department brought poet Jonathan Fink to the elegant setting of the ballroom of The Grace Museum during an ArtWalk evening. This poem, which appeared originally in The New England Review, traces the history of the famous painting by Rembrandt from the moment paint is brushed on canvas to centuries later when it is slashed in its frame by thieves, rolled up, and stolen from a Boston Museum (to this day the painting remains unrecovered). It was a perfect instance of Fink’s method of focusing his poems on less well-known historical events or seeing familiar ones from a new perspective. An example of the latter was his reading of “The Prodigal Son,” a poem which imagines what the story would have been like if it told of the women who surely must have been present at the time in the form of a mother, sisters, and others. The evening concluded with poems from Fink’s sequence looking at the 1911 Triangle Shirtwaist Factory Fire in New York City. Those poems were augmented with archival black and white photos projected on a screen. 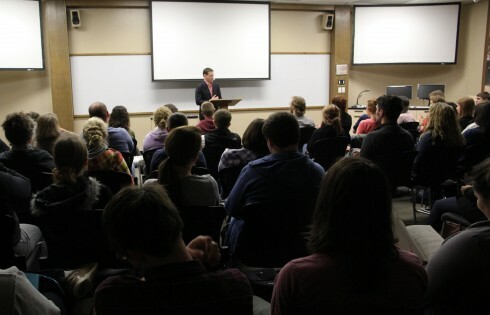 Following a packed special poetry chapel, a lunch with graduate students, and a class session on revising one’s prose, the evening reading was a perfect capper to this celebration of National Poetry Month spent in the presence of a stellar poet. 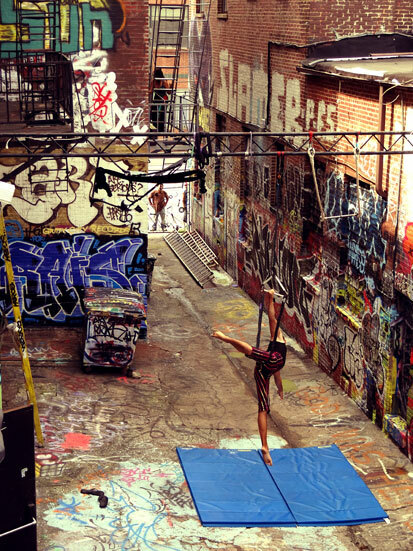 Elena Kua, who completed our Master’s in English as a creative writing student in the fall 2014, has just had a creative nonfiction piece published in The Baltimore Review. She’s excited to report that she even received payment for her work! The piece, “Engraving,” tells about Elena’s aging father and recreates some of his years growing up in the southern part of Malaysia. Elena is currently living back home in Maylasia with husband See Huang Lim (another of our Master’s alumni). The two of them are awaiting word this month on whether they will receive visas to do religious work in Japan. You can read “Engraving,” HERE. 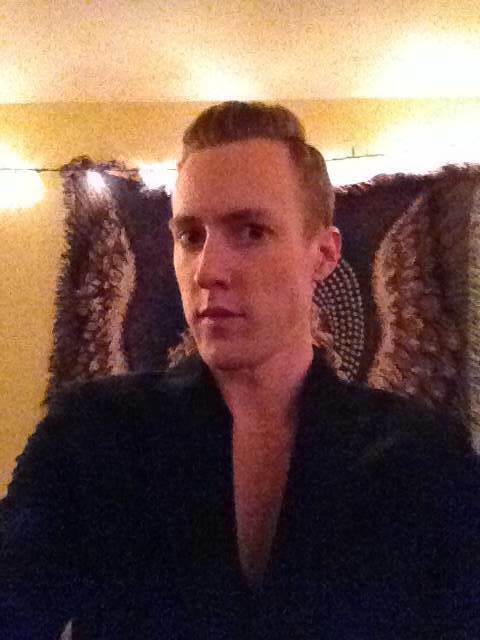 When we last saw English major Tanner Hadfield he was headed off to the land of the Rockies (and the Broncos! for football fans) as he prepared to pursue an MFA in Creative Writing at the University of Colorado, Boulder. Tanner went on to prove that his real forte was in fiction writing. 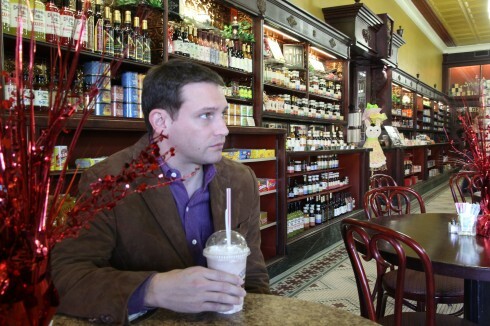 His story in a semi-magical realist mode, “Snowing in Darling,” written a year later, won first place in the 2011 Texas Association of Creative Writing Teachers (TACWT) contest. With that kind of “back story,” we’re not to surprised to get this update about what’s been going on in Boulder. Since joining the UC program, he has been teaching freshman and sophomore classes. Having learned of the above accomplishments from a well-informed source, we thought we’d conclude this post/update by contacting Tanner himself and asking him to respond to a couple of questions about the writing life. INKWELL: What’s the biggest thing you’ve learned about writing since studying it at the graduate level? TANNER: It’s still an ongoing process, and definitely a scary one, but the biggest advance would have to be learning to remove myself from my writing vacuum. That is, letting go of empty self-expression and vague notions of success in favor of writing for an actual real world audience, with an actual purpose in conversation with contemporary culture and literature. Very many people are very good writers inside the safety of their own vacuum and most of them stay there forever. INKWELL: As someone who works as a fiction editor, what kinds of stories attract you and what do you see in stories that immediately generate a thumbs-down? TANNER: I’m attracted to stories with a rich, economical prose style and angle. The knowing chance of folly via abstraction. An immediate thumbs-down comes from a lack of immediacy. If one waits even until the second paragraph to get to the good stuff, one’s odds become abysmal. Merely competent writing is of no use and won’t buy one time outside the classroom (though achieving competence is certainly a necessary step in the process of becoming a real writer). This is just the nature of the present world of writing. It may not be cutthroat, but it’s incredibly competitive! 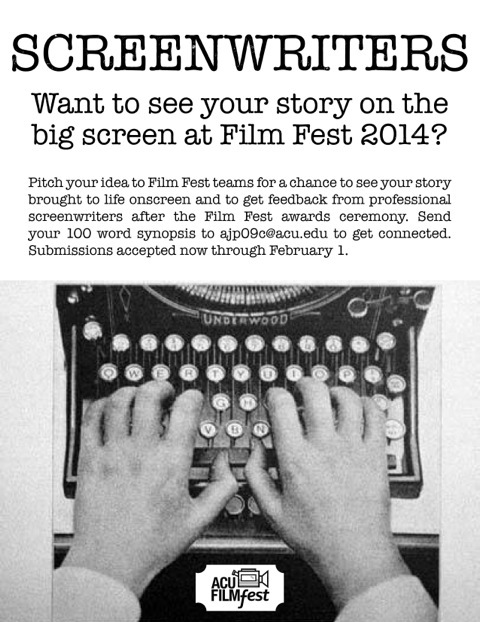 FilmFest – Pitch Your Script Idea! Culp Professor Reading This Tuesday Nite! Join Dr. Chris Willerton for the 5h Annual Culp Professor Reading. It is now a tradition in our department that each year the current Culp Professor shares some of his or her research. The Culp Professor, who is appointed for a 3-year term, spends time researching and writing a project with the aim of publishing. The reading becomes a venue to demonstrate over the course of 60 minutes that learning can be both illuminating and fun. At last year’s event English faculty played a live game of Clue to complement Dr. Willerton’s research into the art of the detective novel. 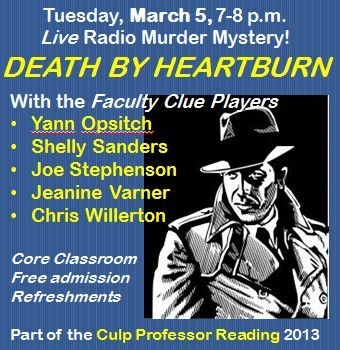 This year different faculty members will perform a radio script murder mystery. Come on out for what is sure to be a fun evening! Three graduate students and one faculty member from our department received awards for their paper submissions to the Conference of College Teachers of English (CCTE) and the Texas College English Association, hosted on the ACU campus Feb. 21-23. The Best Poetry Award went to Al Haley, professor and writer in residence, for his reading of selections from his volume-in-progress of poems about the business world, I Loved a Capitalist. Each winner will have their work published in the 2013 edition of CCTE Studies, a peer-reviewed scholarly journal. 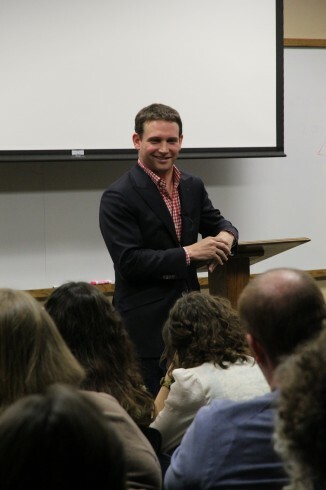 Last Thursday night the appearance of the “bard of Pumpkin Bend, Arkansas”, Greg Browderville filled the Core Classroom with interested students, poetry lovers, and English faculty. The evening ended with an extensive and freewheeling Q & A session in which Brownderville confessed an early, almost obsessive fascination with words and how they sound, including one of his favorites, “Swiss”. A final piece of advice to aspiring poets was to discover a “sweet spot” or state of mind that allows them to write at a peak state of creativity. Brownderville stayed an extra day and took in the art at the Old Jail Art Museum in Albany, enjoyed a milkshake in the old soda shop (below) with Prof. Al Haley , and on Saturday held a different crowd in rapt attention. This time he read poems for the Conference of College Teachers of English (CCTE) at their annual meeting. Another new poem broke the air waves, again a crowd pleaser, this one about an existentially surreal customer defeating every effort of Madison the waitress to take his order. 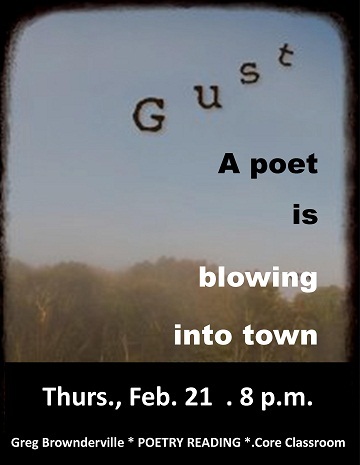 Poet Greg Brownderville, author of the 2011 poetry collection Gust, will read from his work Thursday, Feb. 21, at 8 p.m. in the Core Classroom. In his lush like kudzu lines Brownderville narrates stories of Ozark holy rollers, backwood voodoo rituals, tornadoes touching down, gigging for frogs on the brown river and more, stirred to a boil by the voice of a young man coming of age and trying to figure out what it all means. Brownderville commands the complex eloquence of Southerners who love not only local color but also high-flown rhetoric. Instead of reinforcing stereotypes about rural folks’ thought and speech, he challenges our assumptions by presenting real life as a festival of mixed diction. Highlights include a press conference with a bizarrely poetic rural sheriff, a Zimbabwean meter never before employed in English, a rock and roll song interrupted by a Walmart intercom, and poems about the exploitation of Italians in Arkansas cotton fields. 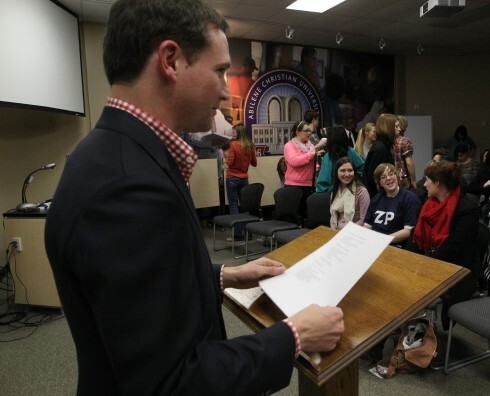 A native of Pumpkin Bend, Arkansas, Brownderville is an Assistant Professor of English at Southern Methodist University. He will be on campus on Friday as well and will speak to sections of American Lit classes taught by Prof. Jeremy Elliot. On Saturday the poet will give a noon reading at the CCTE conference being hosted by our department in the Hunter Welcome Center. 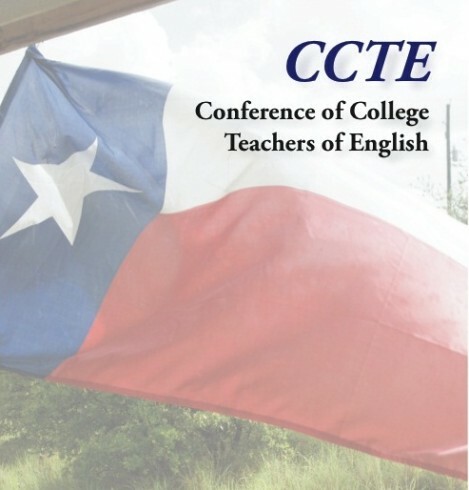 Members of the Conference of College Teachers of English (CCTE) and the Texas Colege English Association (TCEA) will meet in the ACU Hunter Welcome Center later this week to present a varied menu of papers on literature and rhetoric and topics in teaching. In addition, the conference will feature five sessions of creative writers reading from their work. CCTE is a Texas-based organization that is currently celebrating its 80th year of its founding at the University of Texas. 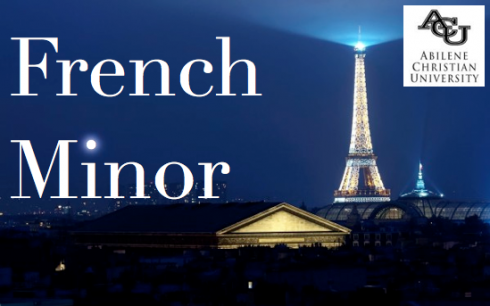 Perhaps you know that ACU already offers a Bachelor of Arts in both Spanish and Spanish for Teacher Certification, but what you may not heard is that ACU now offers a French minor! If you have a love of the most romantic language in the world or if you’re fascinated by the culture of the artistic hotspot of the world, this minor is for you. Should you need more convincing, please read on. Why pursue a French minor? Many US companies do business with France, Quebec or the many French-speaking African countries. You can pursue studies in French Language and Literature and French studies in general. The French minor will help you secure knowledge of a second language if you wish to pursue a major or an MA in another language such as Spanish. The French language is important for medical or mission work in Europe, Quebec and Africa. 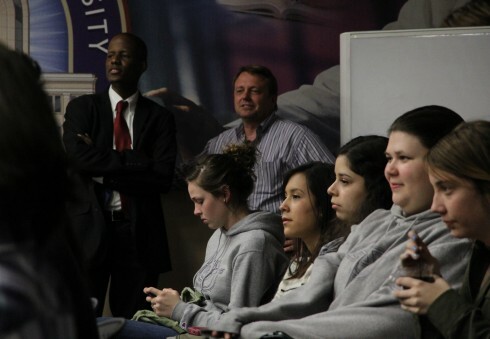 Students wishing to pursue a French minor at ACU can do so beginning this fall (2012). The French minor requires 12 hours of French beyond the Intermediate level. In order to enter Intermediate French students need to have completed beginners French 1 and 2 (FLFR 111 three hours course). A 400 level French 3 hours course is being taught this fall and another advanced 300 level 3 hours course will be taught in the Spring of 2013. Tentative plans are under way for 6 more hours of advanced French to be taught in France in the summer of 2013.